Flex-A-Lite 900 CFM straight blade fan. Draws 7.7 amps. Shallow 2.25" depth for tight spaces. Flex-A-Lite 920 CFM curved blade electric fan provides quieter operation than a straight blade fan. Draws 7.7 amps. Shallow 2 9/16" depth for tight spaces. Flex-A-Lite 1100 CFM straight blade fan. Draws only 8 amps. Overall size 12 7/8" X 10 3/4" X 3 1/4" deep. Flex-A-Lite 1505 CFM curved blade fan provides quiter operation than a straight blade fan. Draws 9.2 amps. Overall size 14 1/2" X 12 3/4" X 3 3/4". Flex-A-Lite 1585 CFM straight blade fan. Draws 9.5 amps. Overall size 14 7/8" X 14 1/2" X 3 1/2". 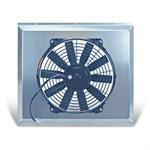 Aluminum Fan Shroud with Flex-A-Lite 2000 CFM 16" electric fan. Shroud measures 24"W X 19 1/2"T X 4.25"D. Will fit + many applications. Draws 18.5 AMPS. 100% Made in the USA. 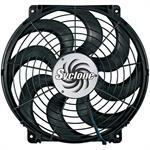 Syclone 2500 CFM Fan. Measures 16 1/2" x 16". Total depth is 4". "S" Blade design provides quiet operation. 17 amp draw. Can be used as pusher or puller. Flex-A-Lite 2500 CFM straight blade pusher fan. Draws 20 amps. Mount in front of the radiator or A/C condenser for additional air flow. Overall size 16 5/8" X 16" X 3 1/2"
Made in USA 3000 CFM Fan/Shroud assembly. Shroud measures 18" x 16". Total depth is 4 1/4". "S" Blade design provides quiet operation. Made in USA 3000 CFM Fan/Shroud assembly. Includes an adjustable thermostatic control and A/C relay kit. Shroud measures 18" x 16". Total depth is 4 1/4". "S" Blade design provides quiet operation. Black Magic Extreme 3300 CFM Fan/Shroud assembly. 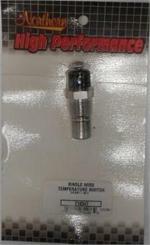 Shroud measures 17 1/2" x 21 1/2". Total depth is 4 1/4". "S" Blade design provides quiet operation. Black Magic Extreme 3300 CFM Fan/Shroud assembly. Includes an adjustable thermostatic control and A/C relay kit. Shroud measures 17 1/2" x 21 1/2". Total depth is 4 1/4". "S" Blade design provides quiet operation. SPAL 30102042 1800CFM 14" Fan Paddle Blade (Puller). This fan is designed to mount on the engine side of the radiator. 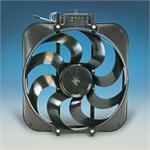 The curved blade design keeps fan noise to a minimum. Dual fan and aluminum fan shroud assembly. Approx 24" wide & 15" tall. Top quality SPAL fans pull over 1900 CFM and draw 20 amps. Louvered shroud allows increased airflow at high speed. See "More Info" for more detailed description. Dual fan and aluminum fan shroud assembly. Approx 20.5" wide & 16 1/2" tall. 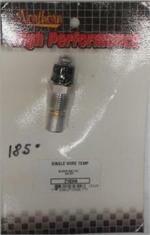 Top quality SPAL fans pull 1600 CFM and draw 20 amps. Louvered shroud allows increased airflow at high speed. See "More Info" for more detailed description. With the mounting flanges on the top and bottom the total width is 25 5/8” and the height of the shroud “box” is 17 1/4”. The total height including the mounting flanges is 18 ¼”. For more Information see "More Info" Section.